Sometimes Christmas wishes come true. 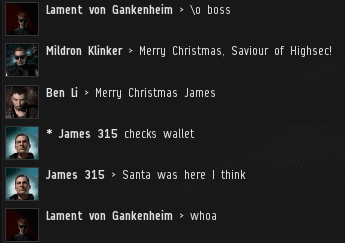 Santa Claus came to highsec this week, and I noticed that his appearance bore a striking similarity to Elite Harvester. A relative of his, perhaps. A mysterious self-proclaimed miner with a taste for New Order shares, Elite Harvester is beloved by gankers everywhere. When a ganker says "Some of my best friends are miners," they're probably referring to him. I think this means we get a little extra turkey and stuffing this year. 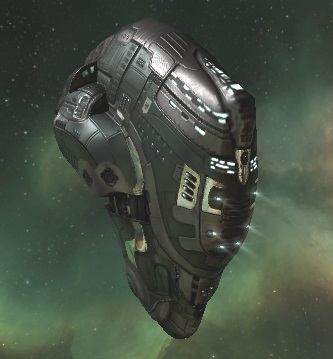 In reading Elite Harvester's EVEmail, I'm reminded of a simple truth about EVE. Some people prize isk and others skillpoints, but wisdom is more valuable than both of these. Elite Harvester is rich in wisdom. And graceful humility. 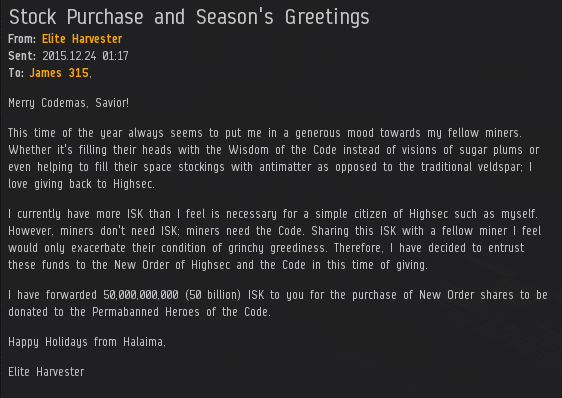 Elite Harvester purchased 50,000 shares but not for himself; he did it on behalf of the Permabanned Heroes of the Code. The New Order often thinks of its martyrs, and it's certainly appropriate to remember them at this time of year. The purchase sends us past the 794, 795, 796, 797, 798, 799, 800 (yay! ), 801, 802, 803, 804, 805, 806, 807, 808, 809, 810, 811, 812, 813, 814, 815, 816, 817, 818, 819, 820, 821, 822, 823, 824, 825, 826, 827, 828, 829, 830, 831, 832, 833, 834, 835, 836, 837, 838, 839, 840, 841, 842, and 843 billion isk marks. 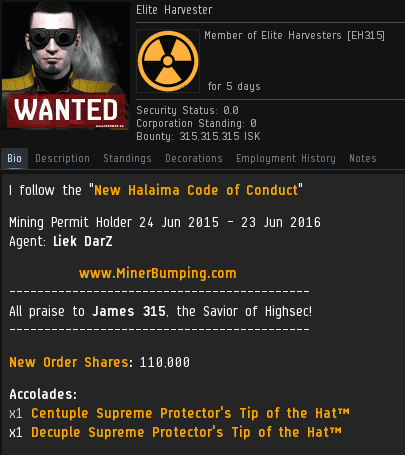 Thanks to Elite Harvester, the Permabanned Heroes of the Code earn a Quintuple-Decuple Supreme Protector's Tip of the Hat™! Every share counts. The Atomic Amish earn a Supreme Protector's Tip of the Hat™ for sending us past the 844 billion isk mark with their purchase of 315 shares. The trillion feels a lot closer today. I wonder how the Anti-Gankers and rebel carebears feel when they see things like this. Can they understand the generosity of the New Order, when they themselves have been consumed by selfishness and greed? I think this post has room for one more helping of Christmas cheer. Remember, no reimbursement is available for ships handed out to you during gank fleets or otherwise provided for by fellow Agents. And while we're at it, the new reimbursement policy also applies to other versions of gank cruisers, such as Mallers and Moas. Why not? It's Christmas after all. AG fails to foil our plans again. Excellent news the code is winning all the time! I remember when the AG guys kept saying it was all a scam and CODE would run out of isk. Welp 140 billion isk later and the catalysts keep on coming. Two Vexors can euthanize any Hulk or Mackinaw regardless of its tank. In most cases yes, there are situations where two Vexors isn't enough however. For .5-.7 2 Vexors will generally kill any Mackinaw or Hulk provided they arent mega-tanked. By the time someone mega tanks a hulk/mackinaw though they're usually mining less than if they were to use a yield fit procurer/skiff while also having less EHP. For .8 - 1.0 you can fit a decent tank and still mine more than a Proc/Skiff and still withstand a Duo-Vexor attack. Yeah, in addition to that, if someone mega tanks their mackinaw or Hulk they are usually code compliant anyways. In my experience non complyers are generally more yield fit than tank fit, but there are sometimes exceptions to that rule. Thanks for the fits, guys! Merry Christmas! I feel smeared with good news! Elite Harvester, you've brought a tear to my eye with your noble generosity! I do believe it will be a long time before the anons on this blog begin singing the "CODE. IS GOING BROKE" tune again. And as for the upgrade to ganking reimbursements, just what high sec needs! Really demonstrates the evolution of our movement, and is one step closer to 100% compliance. Praise the wisdom of our Supreme Protector! Talos Reimbursements at 500 bil? I am actually surprised that the NO is now fitting ships with tank. Miner, calm down. Merry Christmas.